IRELAND HAS VOTED to repeal the Eighth Amendment of the Constitution, paving the way for the legalisation of abortion in some circumstances. The country voted by 66.4% to 33.6% to remove the amendment with more than two million votes cast. At 64.5%, the turnout was one of the highest ever recorded for a referendum in this country and the highest of any referendum since 1992. The result was a landslide victory for the Yes side, which had led in every opinion poll taken throughout the campaign. Minister for Health Simon Harris, who was one of the leading political figures in the campaign, said the electorate had voted Yes after carefully considering all the issues. “I think everybody is pleasantly surprised,” he said. The people of Ireland have said they “want to live in a country that treats women with compassion”. The highest Yes vote was in Dublin Bay South where 78.5% of voters opted for a Yes. It was followed by Dún Laoghaire (77.1%), Dublin Fingal (77%), Dublin Central (76.5%) and Dublin Rathdown (76.1%). The lowest Yes vote was in Cavan, although it still returned a decisive victory for Yes with a result of 55.5% in favour. The Yes result spanned all demographic groups. Exit polls showed that the Yes vote was supported across all social classes, across both urban and rural centres, by both men and women, and by the supporters of all political parties except for Fianna Fáil. In an unprecedented result, the only major demographic group not to support repealing the Eighth Amendment was people aged over 65. Ireland will now look to bring in abortion laws that are similar to the vast majority of countries in Europe. 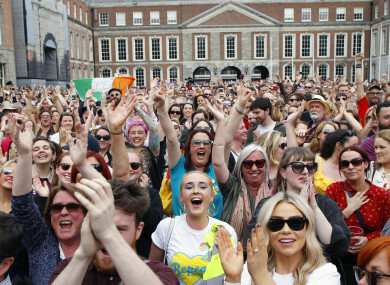 A large crowd gathered in Dublin Castle to celebrate the passing of the referendum. The vote was the culmination of a large grassroots campaign which had lasted for many years before being backed by all the major political parties after the work of the Citizens’ Assembly and the Oireachtas Committee on the Eighth Amendment. Taoiseach Leo Varadkar described the result as “the culmination of a quiet revolution that has taken place in Ireland over the past 10-20 years”. “We trust women, and we respect them to make the right decisions for their healthcare… this gives the government the mandate”. Simon Harris said that it was a turning point for women. “Under the Eighth Amendment, women in crisis pregnancy have been told take the plane, take the boat, today we tell them; take our hand,” he said. “Under the Eighth Amendment, women in crisis have been told you’re on your own. Today we say: we will stand with you. The equal right to life of the unborn will now be removed from the Constitution and replaced by a line which allows for the Oireachtas to make laws for the termination of pregnancy. The government will shortly begin work on passing the draft of the proposed law, which will allow for abortion without restriction up to 12 weeks and in limited circumstances after that up to six months. The government has said that it will aim to have the legislation passed by the end of the year. Additional reporting by Sinead O’Carroll and Cormac Fitzgerald. Email “It's Yes: Ireland has voted to repeal the Eighth Amendment ”. Feedback on “It's Yes: Ireland has voted to repeal the Eighth Amendment ”.